One of my favorite restaurants in my little hometown of San Francisco is Starbelly. It is a lively and casual place, with a well-edited menu and interior atmosphere to match. They are known for the delicious pizzas that come out of their wood fired oven but in my opinion their spaghetti is the winner. If you live in the SF Bay Area, definitely stop in and give the pasta a try. But for those of you who can’t, here is my version of their spaghetti. I tried to capture what I like so much about the dish: fresh and savory, with a touch of heat and kiss of sweetness. 1. Pour the can of tomatoes into a large bowl; crush them by hand (or remove and slice with a knife and return to bowl). Roughly chop the roma tomatoes and add to the bowl of crushed tomatoes. Set aside. 2. Cut the bacon into 1/2 inch pieces and cook in a large sauté pan set over medium heat until fat is translucent and has rendered out into the pan. Transfer bacon to a plate lined with paper towel to drain off excess grease. Set aside. 3. Crush the garlic cloves into sauté pan; cook until fragrant. Add tomatoes, bay leaves, and brown sugar to the pan. Bring to a boil, then reduce heat, cover, and simmer until sauce has reduced by half (about 1 hour). Stir occasionally while seasoning to taste with salt and pepper. When sauce is ready, return bacon to the pan, along with the sliced jalapeño. Remove and discard the bay leaves. 4. While sauce is simmering: cook the spaghetti in a large pot of boiling, salted water until “al dente,” about 9 minutes. It should be firm to the bite. Drain pasta, reserving 1 cup of cooking water. 5. 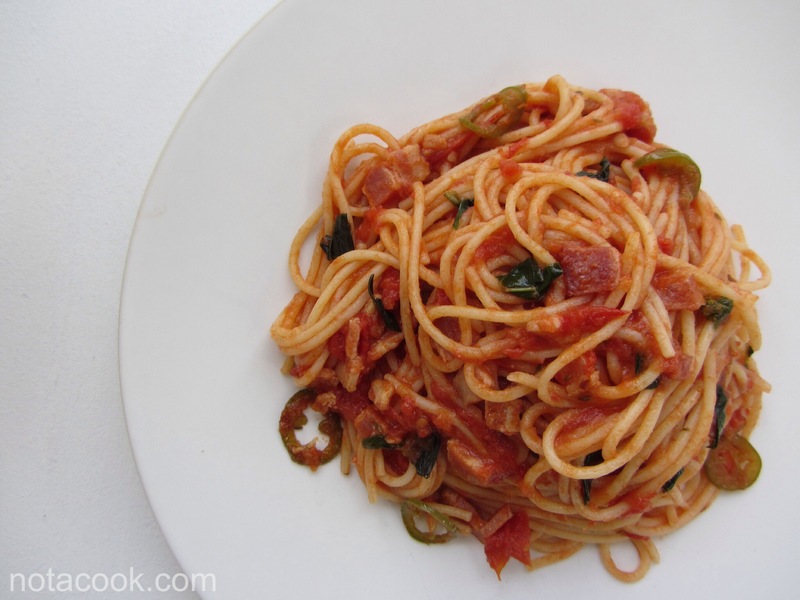 Gently toss spaghetti into pan with marinara sauce. Tear basil leaves into the pasta and toss again, adding the reserved cooking water as needed to thin sauce to desired consistency. Serve immediately. I am shocked that there aren’t any comments for this recipe. Starbelly is also one of my favorite restaurants so I decided to search for their spaghetti recipe. So glad you attempted to recreate it. I tried making this last night and it turned out amazing. The only modification I made was adding more garlic which might have been unnecessary. Adding the fresh jalapenos and basil at the end are what make this dish shine. You’re welcome Sam, and thank you! Glad you enjoyed it, of course no worries about personal modifications – it’s all about taking something and making it yours. Besides, more garlic can never too bad of a thing! One of my favorite pastas is spaghetti in garlic oil!